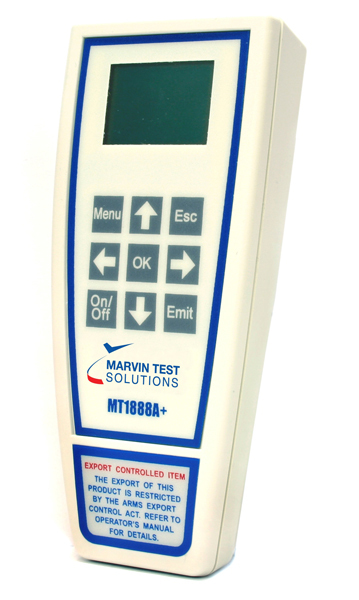 Laser Source Simulator - MT1888 / MT1888A / MT1888A+ | Marvin Test Solutions, Inc. The MT1888A+ adds remote control operation to the MT1888A via an RS422 interface, allowing the ALSS to be controlled by a computer for automated test applications. The MT1888A+/RF supports PRF codes and the MT1888A+/RM supports both PRF and PIM codes. The MT1888A+ is supplied with an ATEasy driver, allowing all functions to be remote controlled. The MT1888 has been certified to operate with Hellfire and Hellfire II seekers. The unit can be ordered under National Stock Number (NSN) 5860-01-495-7441. The MT1888A has been certified to operate with Hellfire and Hellfire II seekers. The unit can be ordered under National Stock Number (NSN) 5860-01-495-7442. The MT1888+/RF has been certified to operate with Hellfire and Hellfire II seekers. The unit can be ordered under National Stock Number (NSN) 5860-01-629-8322. The MT1888+/RM has been certified to operate with Hellfire and Hellfire II seekers. The unit can be ordered under National Stock Number (NSN) 5860-01-629-8342. Advanced Laser Source Simulator with Remote Control operation (PRF only). Advanced Laser Source Simulator with Remote Control operation (PIM and PRF).